Justin A. Cohn | The Journal Gazette Komets forward Brady Shaw, right, shoots the puck at the Huntington Center in Toledo, Ohio, as he's defended by Ryan Obuchowski of the Toledo Walleye on Friday in Game 1 of the Central Division semifinals. Jeremy Wadsworth | The Blade Fort Wayne goalie Zachary Fucale blocks a shot during the second period Friday at the Huntington Center in Toledo. 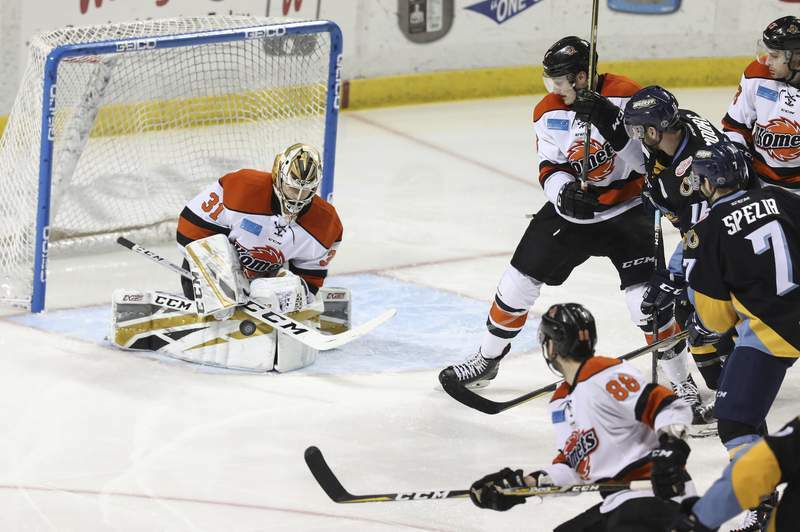 TOLEDO, Ohio – The feeling in the Komets’ locker room was that they can build off this game. Not to excuse the loss, I agree with that. They played a solid road game, losing 3-2 to the Toledo Walleye in the opening game of the Central Division semifinals, thanks to a bad span of 23 seconds in the third period where a pair of turnovers at the offensive blue line led to odd-man rushes and goals by the Walleye’s Bryan Moore and Greg Wolfe. Pat Nagle stopped 28 shots for the victory. Zach Fucale had 35 in the loss. The good news is that the Komets played largely controlled hockey, meaning they didn’t take a slew of dumb penalties and stuck to their game plan. They got good goaltending from Zach Fucale. Brady Shaw was excellent. And they had the Walleye on the ropes in hostile territory. The bad news for the Komets is that they were foiled by those turnovers at the blue, which we’ve seen very often this season. Also, they had problems getting the puck out of their own zone, which is dangerous against a team like Toledo. And there were a few players who were totally invisible. One must be impressed with the mettle of the Walleye, which gave up a third-period game-tying goal to Jake Kamrass and then responded to get the victory. Nonetheless, the Komets proved, if there was any doubt, they can play with Toledo. 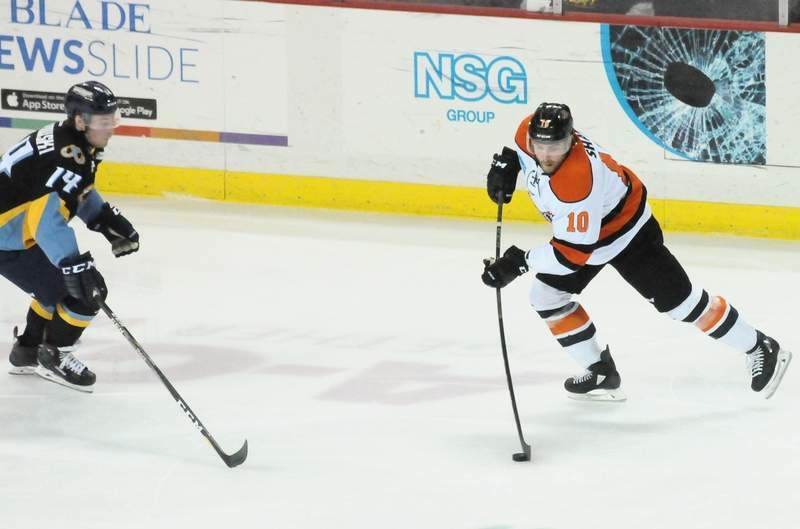 Both teams missed myriad opportunities: Anthony Nellis had two chances from point-blank range he missed on for the Komets and Toledo’s Matt Register and Ryan Obuchowski both hit posts. Should Craig Cescon be able to return for Game 2, that could be a big shift for the Komets. “I thought we played a really good game. We just had a couple mistakes in the third period there. They got two quick ones, which took away our momentum and we can’t allow that,” said Fort Wayne’s Shawn Szydlowski, who sent a pass out of the right corner to set up Brady Shaw for a late power-play goal to finish the scoring. A note beyond the game: The officiating has to get better. There are two referees in the playoffs, and I’m not necessarily a fan of that actually because I’m not convinced you can suddenly go from having one referee to two and have it be reliable. I’m not going to tell you that Andrew Bruggeman and Jacob Rekucki called a bad game because they didn’t, but it wasn’t consistent. I guess you can call the penalty on Szydlowski for shooting the puck into the net after the first period ended, but if you watch it in real time in the game, saying he should stop and making it reasonable for him to do so are two different things. Plus, we almost never see that called and to pull it out in Game 1 of the best rivalry in the league is typical ECHL officiating – guys trying to do too much. And if you’re going to buckle down there, then do it the whole game, but they let a blatant Brenden Kotyk interference that was a dangerous play go, a holding that foiled Anthony Petruzzelli go, and even a high-stick to the face of Petruzzelli go.